My feelings about Mistborn can easily be summarised: fantastic worldbuilding, predictable plot, and cardboard characters. I know this book has a very dedicated fan base though. If you’re a huge fan, this review might not be for you. The premise of Mistborn is a well-known fantasy cliché. Young person from the lower social ranks (farmer/thief/orphan) is told he/she has awesome powers which will help overthrow the evil ruler dude. Think Harry Potter, Eragon, Sword of Truth, even Lord of the Rings in a way. The particular flavour of Mistborn is that our special snowflake is Vin, a skaa thief living on the streets of the capitol of the Final Empire. Vin is found by Kelsier, and he trains her into her Mistborn powers. He adopts her into his own crew and teaches her that people can actually trust other people. I’ve got plenty of material to discuss in this review, but I’ll start with Vin’s character. We spend most of our time in her mind, seeing her development from abused street urchin into confident assassin. At least, that is the idea. For me Mistborn read completely different. At first Vin is distrustful, broken, a whisp of a person. She’s interesting. Then she spends a lot of time with the nobility, spying at balls, dancing at candlelight, and the whole shebang. And she turns into a shallow, overly trusting person. I didn’t believe her for a second. At the beginning of the story, Vin doesn’t even take a drink from someone. After some glitter and glamor with people who would have literally walked over her months ago, she suddenly thinks things like “but they are so nice at balls, they must be good people”. We started with Arya, and ended up with Sansa. Yuck. Vin is supposed to be an assassin, but in the entire book she only kills two people, neither of which she truly plans beforehand. Saying Vin is an assassin is like saying someone is a pâtissier after whipping up a cake at home. Kelsier is the other person whose point of view is shown consistently throughout the book. He has had a tough life – his wife betrayed him to the Lord Ruler and he had to work in mines at terrible conditions. The problem with Kelsier’s point of view is that it’s clear that he’s keeping something from the reader. This secret that’s constantly between the reader and the character made me feel very distant from him. If we can’t truly know him, what is the point of being in his thoughts? My biggest issue is with the plot of Mistborn. It’s really, really, really boring. Seriously. At around page fifty, the crew members outline what they’re going to be doing. They go pretty in-depth, discussing their plans. And for the next four hundred pages they do what they outlined in a few pages. Hardly anything goes wrong. There is no conflict. Nothing interesting happens. They collect weapons, they recruit people, Vin goes to a ball. Vin and Kelsier have a touching moment. They collect weapons, they recruit people, Vin goes to a ball. Vin and Kelsier have a touching moment. Rinse and repeat over and over again. Only at the five-hundred page mark does something else than this happen. And when it does, it’s actually quite great. it’s full of twists and suspense. If Sanderson can do this at the end, why isn’t the rest of the book like it? Let’s move on to a positive note. Sanderson is a great world-builder. I really like what he did with the magic system – burning certain metals give Allomancers certain powers. Some people can only burn one metal (Mistings), while others can burn all of them (Mistborns). The system was incredibly thought-through, and it gave him some great material to work with in the action scenes. Which are really good, by the way. It makes me sad there is almost no action until the last part. We see Vin and Kelsier playing around with some Allomancy, but there are very little situations in which the stakes are high. I really wanted to like Mistborn. So many of my online bookish friends love it, but I was disappointed. It’s okay if I don’t like a certain aspect of a book, but when I’m bored for hundreds of pages on end, it’s clearly not working for me. I might read the next book in the series, or not. 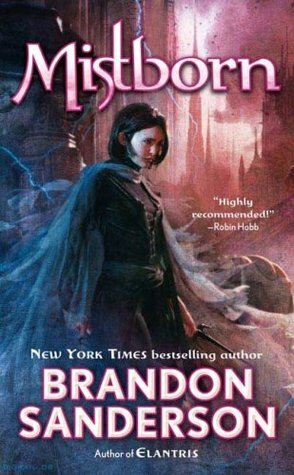 I saw the big reveal of Mistborn coming from page two hundred or so (Sanderson – you’re not as sneaky as you think you are), so I might just opt for looking up spoilers instead.